1. Expedite removal of Maricopa from the FEMA 100-year flood plain. 2. Public/private utilities infrastructure of the city ensures that economic development remains robust and citizens are served in the best and most reliable way. 3. Encourage development of industrial and business parks to enhance employment opportunities and bolster the local economy. 4. Creative placemaking and event tourism – creating a destination city. 5. Evaluate annexation of land to accommodate the city’s projected growth and economic prosperity. 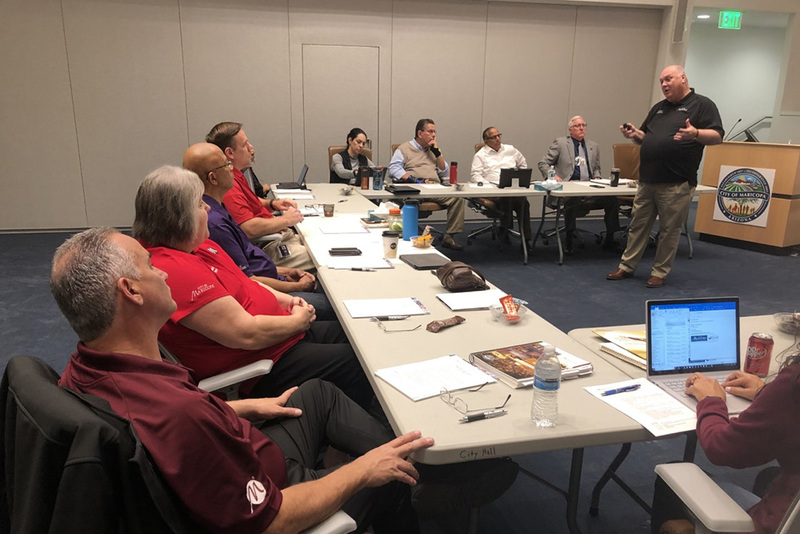 At a city council retreat on Wednesday, Maricopa City Manager Rick Horst recommend the city and Maricopa Economic Development Alliance (MEDA) combine offices because they essentially have the same mission – promoting Maricopa. He said MEDA often has different conversations with individual builders, developers and investors that the city doesn’t, because MEDA can keep information more confidential, while the city may not be able to. The city has been discussing the 500-acre Estrella Gin Industrial Park. Horst suggested the construction of a 10,000 to 12,000 square foot spec building and including MEDA in that new building. He said staffing would be a problem if MEDA were to open an official office. His solution is to combine the city economic development office and MEDA into the same location, so they could help each other. The combined office would only be a small part of the larger spec building. Horst’s seven-hour workshop on Wednesday focused on the city’s 2040 Vision Plan, “which is the foundation of any long-range plan, is aspirational in nature and articulates the desired future state of the community,” according to the presentation. The 2040 plan is intended to inspire the stakeholders in the community to have a common goal in the success of Maricopa. He spoke about how to execute the plan, sustain the city’s mission, government efficiency and the identification of the city’s Wildly Important Goals (WIGS). Expedite removal of Maricopa from the FEMA 100-year flood plain. Public/private utilities infrastructure of the city ensures that economic development remains robust and citizens are served in the best and most reliable way. Encourage development of industrial and business parks to enhance employment opportunities and bolster the local economy. Creative placemaking and event tourism – creating a destination city. Evaluate annexation of land to accommodate the city’s projected growth and economic prosperity. Horst also spoke about changes and eliminations of city boards which are no longer needed. He recommended eliminating the Non Profit Funding Evaluation Committee, the Veteran Affairs Committee and the Youth Internship Program Advisory Committee. All three committees have not met for quite a while and the Veteran’s committee doesn’t have the expertise necessary to assist Veterans while other community services are available to better assist them, according to Horst. He proposed re-purposing the Parks, Recreation and Library Advisory Committee into the Community Services Advisory Board. He also recommended combining Cultural Affairs, Event Tourism, Age-Friendly Maricopa and Arts commissions into the newly established Community Services Advisory Board. He recommended making the Community Services Advisory Board a nine-person board appointed by city council. He also recommended sub-committees under the board.